When a high school friend gets kidnapped in an historic theater, you, as Nancy Drew, are plunged into a desperate race against the clock. With the theater being torn down in just three days, can Nancy outwit the kidnapper and rescue her friend before the wrecking ball flies? Or will this be Maya's final scene? 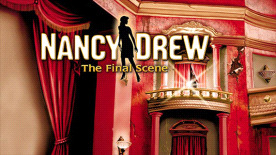 Nancy Drew®: The Final Scene is a first-person perspective, point-and-click adventure game. The player is Nancy Drew and has to solve a mystery. Explore rich environments for clues, interrogate suspects, and solve puzzles and mini-games.